The AIB Seed Capital Fund, co-managed by Enterprise Equity Venture Capital, has led an equity investment of €2.2m in Galway based medical device start-up, Capsos Medical. The AIB Start-Up Accelerator Fund (managed by ACT Venture Capital) was also part of the investment syndicate. 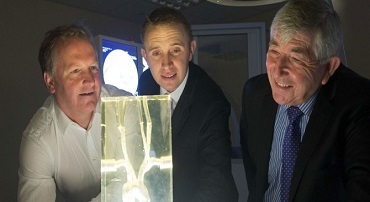 Galway-based Capsos Medical is pioneering a new treatment of Chronic Total Occlusions (CTOs) which are complete blockages of an artery resulting in reduced blood flow and a lower quality of life. Their breakthrough ‘CapBuster’ solution is a balloon catheter and guidewire combination device that provides physicians with an easy-to-use and innovative solution which will re-open the most resistant occlusions where a calcified cap has formed on the surface of the blockage. The funding syndicate included AIB Seed Capital Fund, Business Angels from HBAN’s MedTech and IRRUS Investment syndicates, Enterprise Ireland, Western Development Commission, AIB Start Up Accelerator Fund and the company founders. The investment will accelerate the development of CapBuster, prove the product’s value through clinical studies and enable the company to access the large global market. Addressing a recognised gap in the market, ‘CapBuster’, which has a US granted patent, provides a simple, cost effective and mechanically superior method which is set to improve patient quality of life and has the potential to eliminate the need for more expensive and invasive alternatives such as medication and bypass surgery which are the current standard of care. CTOs are encountered in up to 30% of all patients who undergo angiography. This equates to approximately 1.8m CTO’s globally. 50% are treated with medication, 40% receive bypass surgery, and only 10% are currently treated using minimally invasive techniques. The ‘CapBuster’ device will enable minimally invasive treatment of a large segment of this market. According to Brendan McLaughlin, Capsos Medical CEO: “Penetrating CTOs is often described as the final frontier of angioplasty, so new treatment methods attract a lot of attention from the clinical community. To date, none of the existing devices on the market can penetrate a calcified cap in a safe, slow and controlled manner.